On Wednesday, Google launched a new iteration of its own Chrome OS-based laptops. The new notebook has a different form-factor and can be transformed into a tablet. It has a new name in the Pixelbook. And, it has received a hardware upgrade when compared to the previous-gen Chromebook Pixel. The price of Google’s Pixelbook is higher compared to other Chromebooks, but being a flagship model, it has a number of advantages over its brethren, including up to a 512 GB SSD, its own stylus, and Google Assistant support. Google entered the market of PCs with its own Chromebook Pixel laptop in early 2013, more than 1.5 years after Acer and Samsung launched the first Chromebook notebooks. Neither of the PC makers addressed the high-end of the market with Chrome OS-powered systems, so Google wanted to create a flagship that would show all of the advantages of its OS. For its first-gen Pixel Chromebook, Google chose a 12.85” display with a 2560×1700 resolution and a 3:2 aspect ratio, which offered a very high pixel density at the time, used an aluminum chassis, along with Intel’s high-end Core i5-3427U (Ivy Bridge) CPU to ensure smooth performance. The company released its second-gen Chromebook Pixel in early 2015. The laptop used the same premium display, but was made a bit thinner, integrated Intel’s Core i5-5200U/5500U (Broadwell) CPU with a considerably more powerful iGPU, and 8, or even 16 GB of DDR3 RAM. Neither the first, nor the second generation Google Pixel has ever had much success in the market. The systems were criticized for miniscule 32 or 64 GB SSDs, their reliance on Internet connection, and limitations of the Google Chrome OS in general. They were also only available from Google, and carried a hefty price premium over the other Chromebooks in the market. 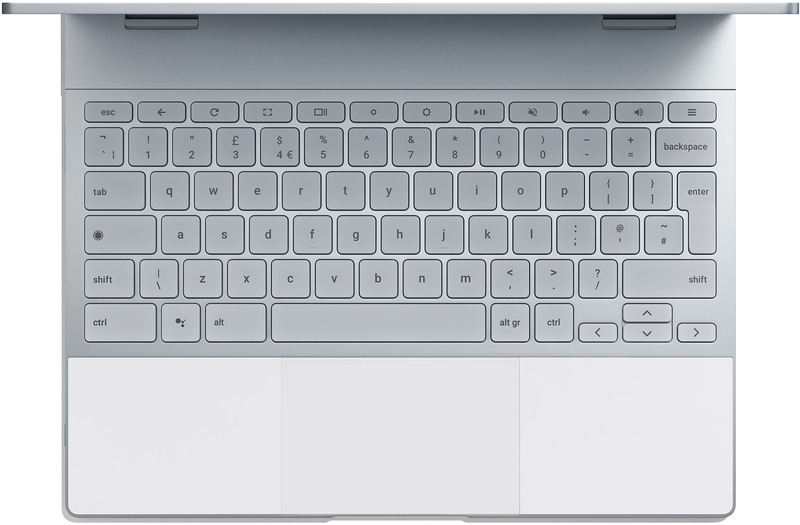 Conceptually, the Google Pixelbook is still a flagship Chromebook designed to show what an ideal PC based on the Chrome OS should be like, and Google is hoping the new unit addresses multiple drawbacks of its predecessors. 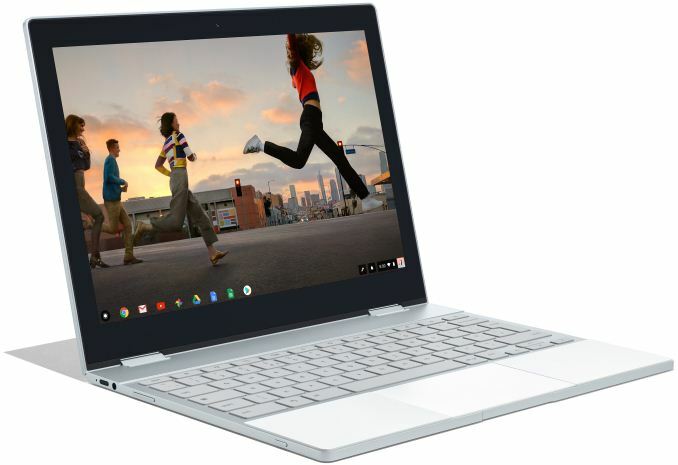 The Pixelbook is a convertible PC that comes in an aluminum unibody chassis with 360° hinges, which enables it to be used in laptop, tablet, tent, and entertainment modes. The convertible form-factor ensures that it will be easy for consumers to use Android apps optimized for larger screens, and Google says the number of apps that support this is growing. The Pixelbook is also considerably thinner and lighter than its predecessors were. It is 10.3 mm thick and weighs around 1.1 kilograms (2.4 lbs). It is still not a tablet from the iPad’s point of view, but it is lighter and thinner than most, or maybe all, Chromebooks on the market. With the Pixelbook, Google stays true to 3:2 aspect ratio, but the new 12.3” display has a bit lower resolution than its predecessors, coming in at 2400×1600. The company says that 3:2 aspect is better suited for web surfing and recently it gained traction with the launch of various products, such as the Microsoft Surface Pro. Just like the latter, the Pixelbook supports Google’s Pixelbook Pen (sold separately), enabling artists to draw and the rest to use it as a stylus or a pen. At present, the Pixelbook Pen is supported by six apps: Evernote, Google Keep, Infinite Painter, Nebo, SketchBook and Squid. Google hopes that eventually the number of programs supporting the Pen will grow. Another important feature of the Google Pixelbook is support for Google Assistant. Now that all Apple’s Macs are equipped with Siri and Microsoft Windows has Cortana, an AI-based assistant was a must for the new Chromebook. At present Google has not discussed if there are differences in implementation between the PC and phone, but expect support for usual features already supported by Android based devices. 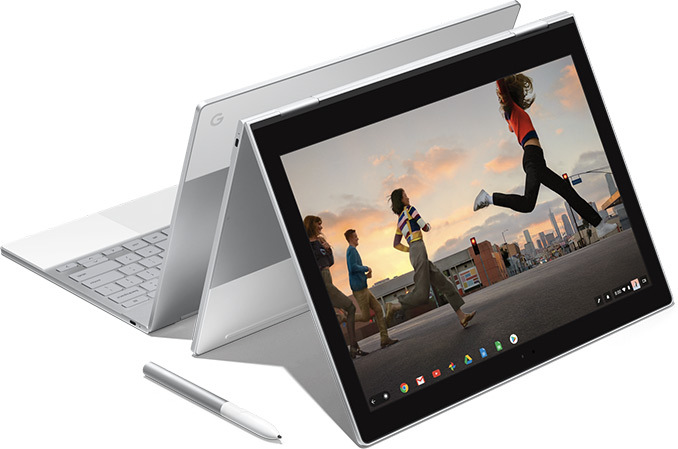 As for internal hardware, Google has launched three configurations of Pixelbook based on Intel’s Core i5 or i7 ‘Kaby Lake’ processors. The systems are to be equipped with 8 or 16 GB of RAM and 128 GB, 256 GB or 512 GB SSDs, indicating that the new Pixelbook is not going to rely the Internet as its primary source data storage. Decent amount of RAM and a high-capacity drive will enable Pixelbook to run demanding programs even in offline mode, and have plenty of room left over for locally stored data and documents. As for connectivity, the system is equipped with Wi-Fi, Bluetooth, a 720p webcam, speakers, a microphone and a headphone jack. There are two USB Type-C ports, which are used for data, charging and display output. Unlike the Chromebook Pixel, the Pixelbook will not come with an optional 4G/LTE modem, but will use smartphones for connectivity when no Wi-Fi is present. This seems like a step back for the idea of Chrome OS though. In addition, the Pixelbook has a TPM chip, a 3-axis gyroscope, a magnetometer and a Hall Effect sensor, which are a typical set of sensors for Android-powered devices and an indicator that Google expects Android apps to play an important role for its PCs going forward. As for battery life, Google says that the Pixelbook can work for 10 hours on one charge and needs only 15 minutes of charging to last for two hours. 11.4" × 8.7" × 0.84"
Wrapping things up, it look like Google wants to address broader audiences with its Pixelbook. The company equipped its laptop with a relatively large integrated storage, thus lowering its reliance on the cloud storage and services. It introduced the Pixelbook Pen (sold separately for $99) for creative professionals and worked with various software makers to develop productivity, creativity and entertainment apps for the Chrome OS. Finally, Google has learnt from its past mistakes and the Pixelbook will be available not only directly from the company, but also from retailers like Best Buy, Abt and B&H. As for pricing, the entry-level Pixelbook will cost $999, whereas the most advanced model will retail for $1649. It's still a lot for a Chromebook, but Google has stuck to its goal of offering an aspirational Chrome OS laptop. Yeah but it's still $1K+ for a Chromebook. for those who are basically only using a web-browser on their laptop, (and there are a ton of those people), what's the problem?